Coordinate Transformations in the Genesis of Directed Action: Introduction. Directed Limb Movements. Saccadic Eye Movements. Concluding Remarks. Attention: A Cognitive Neuroscience Framework for Viewing Attention. Developmental Issues and Methods in the Study of Visual Attention. The Evolution of Attentional Structures. Cultural Influences on Attention. Computational Conceptualizations and Models of Attention. Philosophical Approaches to Attention. Final Comment. Categorization: Overview. Methods of Inquiry. Challenges and Opportunites. Reasoning: Reasoning. Reasoning by Formal Systems: Weak Methods. Reasoning by Similarity: Strong Methods. Structural Alignment in Reasoning. Summary and Discussion. Cognitive Development: The Nativist-Empiricist Debate. Constraints on Learning-Lessons from Ethology. Constraints on Word Learning. Lessons About Cognitive Architecture from Developmental Studies of Domain Specificity. Beyond Innate Constraints-Theory Change, Conceptual Change. Infant Representations-Perceptual or Conceptual? Maturation, Critical Periods, and the "Less-Is-More" Hypothesis. Appeals to Maturation in Explaining Developmental Change. Critical Periods in Development: Language Acquisition. Possible Cognitive Benefits of Immaturity: The Less-Is-More Hypothesis. Some Final Concluding Remarks. The Brain Basis of Syntactic Processes: Architecture, Ontogeny, and Phylogeny: Introduction. Part 1: The Brain Architecture of Syntactic Processes Historical Background. Part 2: Ontogeny of the Neural Substrates of Syntactic Processing. Part 3: Phylogeny. Conclusion. 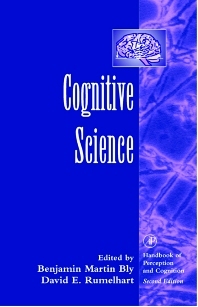 The Cognitive Neuroscience Approach: Foundations of Cognitive Neuroscience. Attention. High-Level Vision. Memory. Conclusions. Emotion: Introduction. What Is an Emotion? Definitions and Theories. Central Issues in the Study of Emotion. A Personal Interlude. How Many Emotions?-Do We Need a Cluster of Explanations? Index. The interdisciplinary field of cognitive science brings together elements of cognitive psychology, mathematics, perception, and linguistics. Focusing on the main areas of exploration in this field today, Cognitive Science presents comprehensive overviews of research findings and discusses new cross-over areas of interest. Contributors represent the most senior and well-established names in the field. This volume serves as a high-level introduction, with sufficient breadth to be a graduate-level text, and enough depth to be a valued reference source to researchers. Psychologists and cognitive scientists, in particular, and natural scientists, in general; all those interested in perception and cognition.